Copenhagen, 18 May 2017: The new breakthrough patent-pending display technology was recently unveiled to a small audience in a surprise demonstration at the national aquarium in Copenhagen, Denmark. Here the new display showed a realistic 3D rocket launch taking place about two kilometres out on the water. 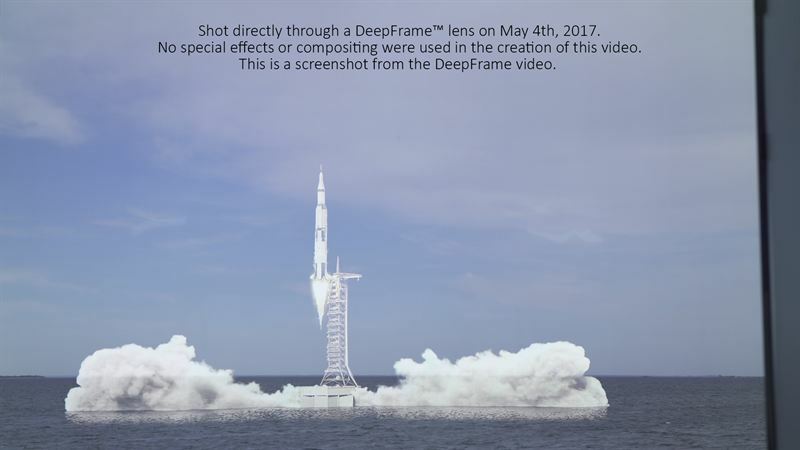 A video crew captured the reaction from the spectators stunned by the realistic and unexpected lift-off taking place in front of their eyes, highlighting DeepFrame’s future potential. DeepFrame is based on a combination of well-known technologies, refined through high technical quality and precision in the production phase. The image from a curved video screen is deflected and enlarged in a custom-made glass optic. This glass optic, in its current form of 64 inches (115x115cm) is perceived as a clear transparent window. The other side of the window shows the reality you are in, combined with the projection of the image from the video screen. Because the glass optics also greatly magnify the image, a screen of just 65 inches, can create a projected animation that covers an area of ​​several square miles. Founded in Denmark in 2008, Realfiction is a market innovator within mixed-reality solutions, a market estimated to reach USD 80 billion in 2025. Realfiction’s first product, Dreamoc, has since its launch sold over 10.000 units, and the company is now launching its new patent-pending technology DeepFrame, a series of ground-breaking large format mixed-reality screens. DeepFrame offers a wealth of new applications for companies across industries such as entertainment, manufacturing and retail, as well as a broad range of future consumer products.